Performers include: Tyler James Williams, Chris Rock, Vincent Martella, Terry Crews, Tequan Richmond, Tichina Arnold, Imani Hakim, Jacqueline Mazarella, Travis T. Flory, Kevontay Jackson, Ernest Thomas, Jeris Poindexter, Jackee Harry, Michael Estime, Antonio Fargas, Blake Hightower, Todd Bridges, Paige Hurd, Tasia Sherel, Shon Little, Diamond Dawn Cook, Lynda Scarlino, and P.J. Marino. This semi-autobiographical sitcom is loosely based on the childhood of actor and comedian Chris Rock. Set in Brooklyn in the mid-1980s, Rock narrates the series. From his point of view, young Chris (Tyler James Williams) is one of the only normal people around and feels like the world is against him. He’s one of the few African-Americans in his school and even when things seem to be going his way, they eventually take a turn for the worse. Chris’ mom, Rochelle (Tichina Arnold), can be quite intimidating, but is an old softy at heart. She threatens Chris and his siblings with bodily harm, but in the end she’s more bark than bite. Rochelle has trouble holding down jobs and usually ends up quitting them. Julius (Terry Crews) is Chris’ dad, and is just as caring as his mom. Julius is more easygoing overall but is very tightfisted with money. He works delivering newspapers, as a landlord, and picks up other odd jobs to support his family. Drew (Tequan Richmond) is Chris’ little brother and, though he gets into trouble occasionally, Drew has his act together. He even gets the girls that Chris would like. Their sister, Tonya (Imani Hakim), is Daddy’s little girl and revels in tattling on her brothers while getting away with murder herself. Greg Wullger (Vincent Martella) is Chris’ caucasian best friend. Quite the nerd, he’s usually getting bullied right along with Chris. Conversely, Joey Caruso (Travis T. Flory) is the racist school bully who is short, heavy, and constantly picking on Chris and the other kids. 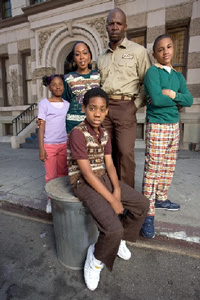 Everybody Hates Chris: Will It Be Cancelled or Return for Season Five?